Sardar Vallabhbhai Patel became the first Deputy Prime Minister of India. President Ram Nath Kovind remembered Sardar Patel as India's Man of Iron, of Integrity, of Integration. New Delhi: President Ram Nath Kovind and Vice President M Venkaiah Naidu today paid tributes to Sardar Vallabhbhai Patel on his 142nd birth anniversary. 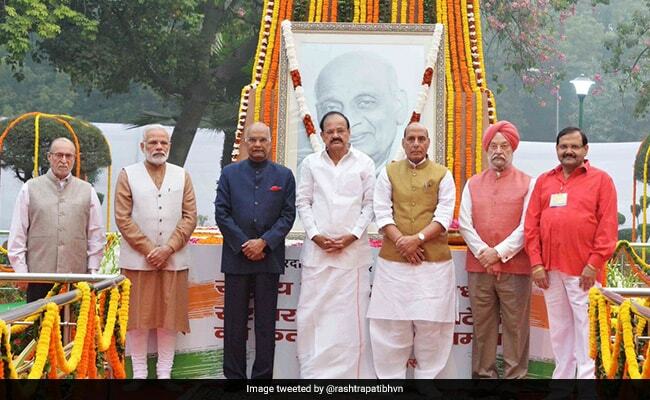 President Kovind remembered Sardar Patel as "India's Man of Iron, of Integrity and of Integration" in the tweet he posted after paying floral tribute at Patel Chowk. Mr Naidu too, paid floral tribute to Sardar Patel, who is credited for the ensuring integration of the nation post Independence. Born on October 31, 1875 in Nadiad, a small village in Gujarat, Sardar Patel became the first Deputy Prime Minister of India. He died on December 15, 1950. Popularly known as the 'Iron Man' of India, Sardar Patel was conferred with the highest civilian honour, Bharat Ratna, in 1991 for his services to the nation.